Originating from Mexico and Guatemala this Cuphea hyssopifolia is a small, round shrub in nature. Mexican Heather has twiggy branches and a horizontal or herring bone-like branching pattern. 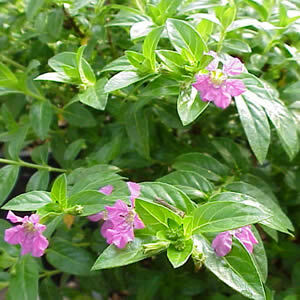 This shrub bears small trumpet-shaped flowers in a light purple to lavender color. Mexican Heather does well in sun to partial shade and is treated as a summer annual. Cuphea hyssopifolia prefers a moist, well-drained soil, is heat tolerant and moderately drought tolerant.